Ishita Saha finds this pretty East European city to be a culinary revelation, made even more magical with the traditional Christmas markets at this time of the year. Before I landed in Praha or Prague, I had a notion that Czech food consisted only of Goulash borrowed from Hungary, that had to be guzzled down with Pivo or beer. The receptionist of my hotel apartment – who doubles up as a city guide during the day – did advise me to taste Guláš or Goulash cooked in the Czech style, in small family run restaurants from one of the less known alleys. But she also told me about the sausages that hang temptingly from the roadside mobile kiosks and other traditional home-cooked Czech food served by the locals at make-shift food stalls, which are set up in the heart of the city during the weekends. And traditional sauces with wild game that is served in the well known restaurants in the New Town. And her list went on and on, making me forget that I had started out with only goulash in my tasting wish list! The beauty of Prague gradually dawns upon the visitor. Voted one of the ten most beautiful cities in Europe, the architecture of the buildings reflect the changes that the city and the region’s history has encompassed. Picturesque boulevards line the Vltava river, and along the main roads and squares within the city as well as the car-free historical town centre. Unaffected to a large extent during World War II, Prague had remained sheltered until the fall of the Iron Curtain. Starom?stské nám?stí or the Old Town Square in the heart of historical Prague – where you can see more different architectural styles by standing in one spot just looking around 360-degrees than entire cities can boast – is testament to this fact. The history of a region shapes its cuisine as well. For centuries, the Czech cuisine had remained influenced by its bigger, better known neighbours’ gastronomy, whether it’s schnitzels and strudels from Austria and Germany or goulashes from Hungary. But there is a vast treasure trove of unique Czech dishes that are slowly coming into the limelight. A slow walk through the city of Prague reveals just that. The streets throng with cafes and restaurants, the most unassuming ones, proudly declaring ‘Traditional Czech Food available’ serving the heartiest meals. Václavské nám?stí or Wenceslas Square, one of the main squares in Prague, was a good starting point for my foodie explorations. A witness to many historical events, demonstrations, celebrations and public gatherings, this square is a part of the historic centre of Prague and a UNESCO World Heritage site. Interestingly, during the Middle Ages, the square was used originally to accommodate horse markets. Wenceslas Square, although a traditional European city square, takes the shape of a long rectangle rather than a square, and reminded me of Parisian boulevards. Flanked by restaurants of various kinds, a few belonging to hotels, which were probably famous once upon a time, this place is a foodie’s paradise. Not least for the roadside kiosks lining both sides of the historic square selling everything from souvenirs to drinks and newspapers, which offer a contrast to all the fashionable stores housed in the surrounding old buildings. But what caught my eye were the mobile kiosks with hanging sausages, lining up the boulevard at 500 metre intervals – this was like a dream come true for me, in which I hop from one kiosk to another munching on sausages of different kinds! One particular stall, with a vivacious lady behind the counter who I decided to make my adopted Czech Momma, quickly became my favourite for her double dose of caramelised onions. Every time I’d pass by, she’d invite me to join the long queue. We did end up in her kiosk more than anywhere else and gorged on the delicious sausages at various odd hours, these sausage stands most popular with the nightclub-returning crowd. Many variations are available – dark meat, white meat and red meat. One can munch on the Bavarian, Italian or Polish sausages – both spicy and non-spicy. Cupped in between toasted or untoasted Chléb/Chleba or rye bread and jutting out of the bread like a banana boat, these giant foot-long sausages are smothered with a pungent mustard sauce or ketchup and generous amounts of caramelised onion. Another must-have in Prague is dumplings – whether it’s in a small family run café or at exclusive restaurants like the Romantic in Grand Hotel Evropa, dumplings can be subject of heated culinary debates. Knedlíky, as they are called, are made from either wheat or potatoes, the brambory. These are steamed and made into large rolls and sliced into smaller dumplings just before serving. Fluffy, light and spongy, the dumplings soak up the meat sauce of the goulash that it’s served with, like a thirsty traveller gulping down water. Often, the dumplings are filled with meat or spinach or sour cabbage, with caramelised onions and braised cabbage served as a P?íloha or a side dish. Dumplings are probably the best accompaniment to the aforementioned goulash, which in Czech Republic, is quite different from the better known Hungarian goulash – while the Czech Goulash is a thick stew usually made from beef, onions, herbs and spices, the latter is served more like a soup. Prague also has a very unique café culture with each Kavárna or café being a little different from each other. Most of them have history written on their walls with noted intellectuals, artists, thinkers and writers having met in their premises. The café menus are extensive, serving delicious light meals and desserts, and some very reliable vegetarian dishes. These cafés are some of the best places to try the local beers, after a brewery tour. Home to the famous Pilsner Urquell and Budweiser Budvar, the Czech have a rich tradition of brewing, and beer tours with a visit to a local brewery is a must. While the street food is definitely going to reel you in with its variety and flavour, Prague is no stranger to fine dining either. Allegro, which had opened in the Four Seasons Hotel, received the first Michelin star amongst all the ex-Communist countries of Central Europe, but is now closed. As of 2012, Prague is home to two Michelin star restaurants, including La Degustation Bohême Bourgeoise in Haštalská Street, serving food that I would call art on a plate. The menu serves contemporary takes on Bohemian cuisine, and has been marked by Anthony Bourdain as one of the best culinary experiences in the world. The Czech menu of Le Bohême is an interpretation of the refined culinary school of Marie B. Svobodová from the late 19th century, and is inspired by seasonal and regional availability of ingredients. The restaurant offers only two set menus – the Degustation Boheme Bourgeoise, consisting of six courses, and the Degustation Du Chef, which is eleven courses. Visiting over the festive period, you will find traditional Christmas delicacies which, to my surprise, feature fish quite heavily, rather than roast turkey. Among the few dishes that still linger on in my taste buds, the T?ebo? trout with a sauce made from Moravian sparkling wine and served with cabbage and kohlrabi, holds centrestage. Other dishes that come to mind include a freshly smoked beef tongue served with creamy purée of yellow peas, and apples with a strong whiff of marjoram, and a simple langoustine with sprinkling of chilli flakes and sesame. An evening here truly unfolds more like an opera rather than an evening of luxurious fine dining! A highlight of Prague during the festive season is of course the Christmas markets, which are considered to be among the most beautiful in the world. Indeed they are. The decorated Christmas tree in the Old Town Square, with the heritage buildings in the background, definitely stood taller than some of the others I’ve seen in other European cities. With hovering clouds and snowflakes drifting down as if in slow motion, it is a fairytale setting that has to be seen to be believed. The stalls selling traditional Christmas goodies and Czech pastries like Trdelink flood the square in front of the Orloj or the famous Astronomical Clock (dating back to the medieval era). To feel it throb, take a seat in one of the (slightly overpriced, thanks to being tourist haunts) restaurants in the huge courtyard of Old Town Square, order some Sva?ák, the local mulled wine, and soak up the sights of swivelling Bohemian crystal stars, the sounds of the curly potato chips being fried and the clinking of celebratory glasses, and the fragrances of the slow-roasting meats. 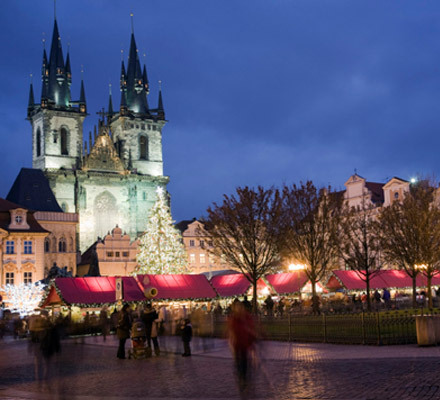 Other than the Old Town Square, the other popular Christmas market is held across the Charles Bridge in the nearby Wenceslas Square. Staying here meant that I was, in effect, living inside a winter wonderland. Chalet-style kiosks with sloping roofs line the square, selling traditional handmade artefacts and glassware, scented candles, Christmas decorations, beautiful hand-embroidered lace tablecloths and traditional costumes. Alongside plenty of food of course, the aromas of which drift through the air. The variations of country sausages, hams and traditional Czech food (served by weight) here are mindboggling – from Paprikový tocenec (beef sausages), and the coiled Vinná klobása sausages to Grilovaný syr (flavourful cheese patties), a Bramborové (boiled, roasted, mashed potatoes) or a Czech Halousky (a smaller but tastier version of gnocchi made with flour and mashed potatoes). While the Old Town Square is where most tourists throng, the Nové Me?sto or the New Town is no less attractive, with quaint restaurants housed in historic buildings surrounding the Prague castle, usually serving traditional Czech food. It was here that I stumbled upon Restaurant U Ševce Matouse, a restaurant that once housed a cobbler’s shop – and enjoyed a sumptuous Christmas meal at a reasonable price. I knew I was in good company when I realised that the likes of Angelina Jolie and Brad Pitt have brought their custom to this restaurant! Clearly Brangelina are on to something! With its many cultural influences, a rich history, taste variations and intricacy amalgamating in one cuisine, Prague, was indeed an unexpected discovery for me – and should be on every foodie’s travel wish-list. Getting there & around: Various airlines offer direct flights to Prague including Emirates (tickets from Dhs2,945, emirates.com), but you could also take the scenic route and fly into Vienna (tickets on Emirates cost from Dhs2,255 ), which is a short five hour flight from Dubai, then drive to Prague from there, which will take under four hours. Hertz offers a convenient car rental option from Vienna airport, with friendly, efficient service and a wide range of cars from small to luxury options. More details on www.hertz.at. Check into the The Mandarin Oriental Prague to enjoy luxury in a location that is both conveniently central, yet tucked away in a quiet cobbled street on the left bank of the Vlatva river, away from the tourist hustle of the Old Town. Housed in a historic monastery dating back to the 14th century, the cluster of low-rise buildings, which have since been carefully restored to become the award-winning luxury hotel it is today, still have history whispering thorough their walls. A true retreat in the heart of the city, in the oldest settled part of Prague in fact, the hotel is home to 99 luxuriously appointed rooms, fitted out with all the mod cons you will need, and amenities including Aromatherapy Associates bathroom products, and thoughtful touches like pillow sleep sprays provided on the bedside. The brand’s Asian heritage comes through in little touches like the Chinese lacquered vanity boxes in the bathrooms and the restaurant’s Asian-inspired menu. Essensia, the hotel’s main restaurant, does away with all the bustle associated with breakfast buffets, in its intimate setting made up of a series of five interconnected rooms with vaulted ceilings – another example of the building’s monastic heritage. At night, it turns into a fine dining venue where executive chef Jiri Stift serves up contemporary Czech cuisine inspired by seasonal ingredients, as well as Asian delicacies. With attractions including Prague Castle and the Charles Bridge all a short distance away, you will no doubt be walking about a lot, so follow up a day of pavement-pounding with a treatment at the luxe spa. Located in a former Renaissance chapel, this outhouse building has been converted into a tranquil oasis of calm. Don’t miss the signature massage where aromatherapy is combined with a fusion of Western and Asian massage techniques – guaranteed to ease travel-weary muscles into relaxation! The hotel concierge is an efficient guide to whatever is going on in the city, and this superlative service is echoed across all the staff, with every guest being made to feel a warm welcome. Room rates start from Euro315 (Dhs1,560), Winter Escape package is priced at Euro355 (stay three nights, pay for two). Visit mandarinoriental.com/prague.